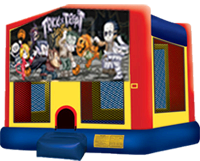 Trick or Treat Bounce House Rental is great for those Halloween Parties or Block Parties. Want to keep the kids close to the house after walking around getting candy? Then this is the perfect answer. Have to neighbors over while the kids are jumping in the bounce house. This is a 15×15 bounce house not one of those smaller 13×13 units that the other companies try to pawn off on you. We also have this Trick or Treat themed on a Combo Bounce House. You can Book Online by clicking on the Kangaroo below.